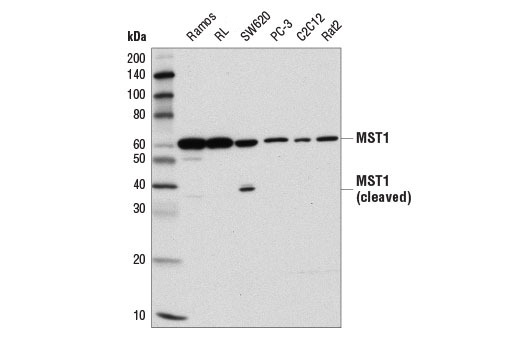 Western blot analysis of extracts from various cell lines using MST1 (D8B9Q) Rabbit mAb. Western blot analysis of extracts from HeLa cells, serum-starved overnight and then vehicle treated (-) or treated with Staurosporine #9953 (1 μM, 4 hr; +), using MST1 (D8B9Q) Rabbit mAb. Staurosporine induces caspase-mediated cleavage of full-length MST1, yielding a 37 kDa amino-terminal fragment detected by this antibody, and an undetected 18 kDa carboxy-terminal fragment. Immunoprecipitation of MST1 from Ramos cell extracts using Rabbit (DA1E) mAb IgG XP® Isotype Control #3900 (lane 2) or MST1 (D8B9Q) Rabbit mAb (lane 3). Lane 1 is 10% input. 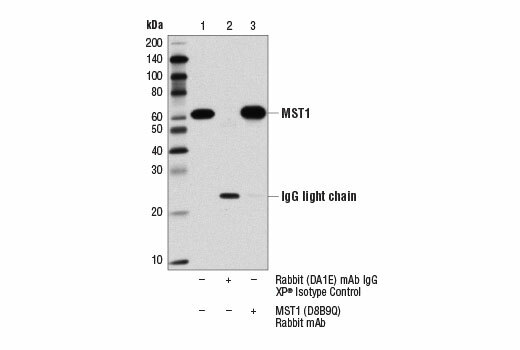 Western blot analysis was performed using MST1 (D8B9Q) Rabbit mAb. 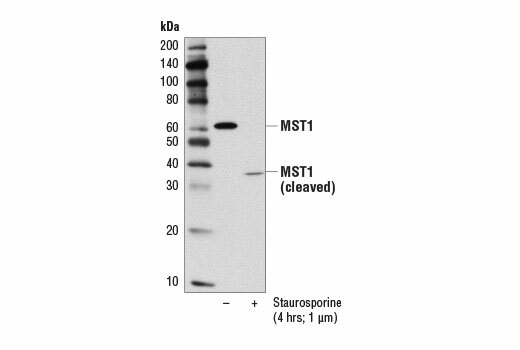 MST1 (D8B9Q) Rabbit mAb recognizes endogenous levels of total MST1 protein. This antibody also detects the 37 kDa amino terminal fragment released by caspase cleavage. Monoclonal antibody is produced by immunizing animals with a synthetic peptide corresponding to residues surrounding Pro9 of human MST1 protein. Mammalian sterile-20-like (MST) kinases are upstream regulators of mitogen-activated protein kinase (MAPK) signaling pathways that regulate multiple cellular processes, including proliferation, apoptosis, migration, and cytoskeletal rearrangement (1). This family of serine/threonine kinases includes MST1 (STK4) and MST2 (STK3), two functionally related proteins with conserved amino-terminal kinase domains and carboxy-terminal regulatory domains that contain nuclear export signals (1-3). During apoptosis, caspase-mediated cleavage of MST1/2 removes the inhibitory regulatory domain, triggering autophosphorylation and activation of the kinase domain, which is translocated to the nucleus. Nuclear translocation of the active kinase induces chromatin condensation and other events associated with apoptotic progression (4). Research studies indicate that MST1/2 are orthologous to Drosophila Hippo (Hpo), one of the core regulatory proteins in the Hippo signaling pathway. This evolutionarily conserved program controls tissue growth and organ size by regulating cell proliferation, apoptosis, and stem cell self-renewal. The mammalian Hippo signaling pathway involves a kinase cascade, where the MST1/2 kinases and the SAV1 scaffold protein form a complex that leads to phosphorylation and activation of LATS1/2. The LATS1/2 kinases phosphorylate YAP and TAZ, promoting cytoplasmic sequestration and inhibition of these transcription coactivators (5). Dan, I. et al. (2001) Trends Cell Biol 11, 220-30. Creasy, C.L. et al. (1996) J Biol Chem 271, 21049-53. Lee, K.K. and Yonehara, S. (2002) J Biol Chem 277, 12351-8. Ura, S. et al. (2001) Proc Natl Acad Sci U S A 98, 10148-53. Zhao, B. et al. (2011) Nat Cell Biol 13, 877-83.